This time last week, we were reminiscing about a major hit from a man in full make-up and an eye-catching outfit. This week, we look back at another, albeit a very different type of song (and performer). 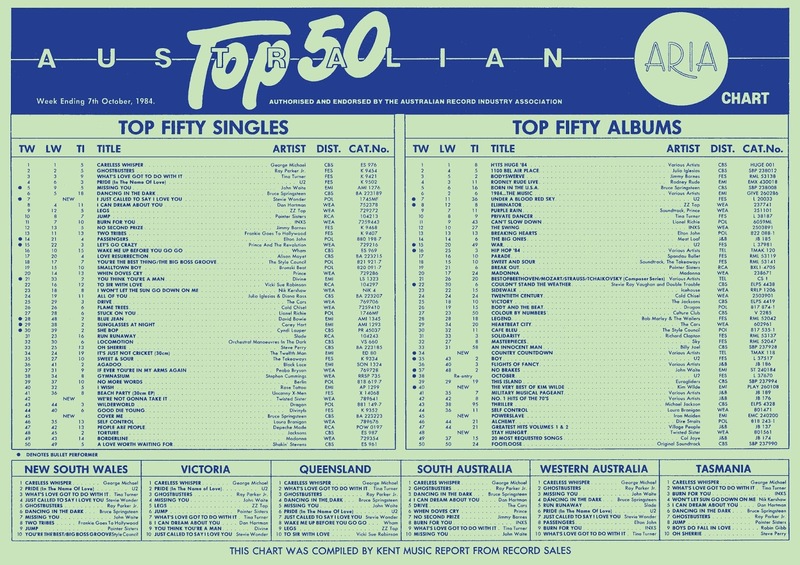 Also this week in 1984, the ARIA singles chart welcomed the single that would go on to spend the longest stretch at number 1 for the year from a man who'd come very close to reaching the top on two previous occasions. A man who was no stranger to the number 1 spot, especially in 1984, remained there this week in 1984. "Careless Whisper" by George Michael spent a third week on top. Not to be confused with the identically named British band of a couple of years later, this The Promise were from Brisbane and this under-rated slice of synthpop was their first single for Festival Records. 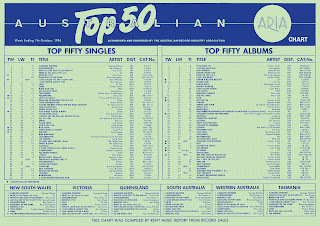 Despite the fact that "Dancing In The Dark" fell from its peak position of number 5 this week, its chart run was far from over and would continue long after this follow-up dropped out of the top 50. The second single from Born In The U.S.A., "Cover Me" had actually been written by Bruce Springsteen with Donna Summer in mind, but he was persuaded to keep it for himself. Interestingly, no music video was made for the song - and I wonder if it might have been a bigger hit had there been one, although it sure got a belting on radio. 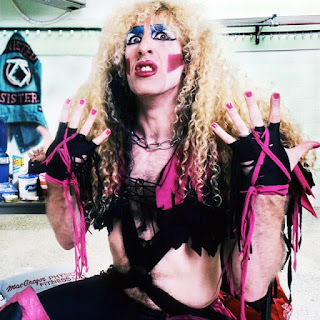 Before Bon Jovi, Mötley Crüe, Poison, Warrant and the rest of the glam metal brigade made any sort of impression in Australia, there was Twisted Sister. Fronted by the frankly quite hideous Dee Snider, the band had come together in the '70s and released its first album in 1982 before being catapulted to the big time on the strength of the lead single from their third album, Stay Hungry. With its non-specific lyrics of defiance and rebellion, "We're Not Gonna Take It" was a classic rock anthem that spoke to kids everywhere, firing them up against whatever or whoever stood in their way. That sentiment was brought to cartoon-ish life in the music video, which featured Animal House star Mark Metcalf as a tyrannical dad whose kids transform into the band's members and take their revenge. Like last week's new entry "She Bop", "We're Not Gonna Take It" was part of the Filthy 15 - a list of songs to which the Parents Music Resource Center objected. In this case, it was deemed too violent, however in his testimony before a Senate hearing, Dee pointed out that the lyrics aren't violent at all and that the action in the music video was inspired by the type seen in Road Runner cartoons. This was Twisted Sister's only major hit in Australia, but as we'll see in coming months, they managed one further top 50 appearance, which prevented them from becoming legitimate one-hit wonders. We'd last seen Stevie Wonder in the top 10 in mid-1982 (along with Paul McCartney) on number 2 hit "Ebony And Ivory" and his previous solo top 10 single had been 1980's "Master Blaster (Jammin')", another chart runner-up. In 1984, he finally went one better with "I Just Called To Say I Love You", which stormed into the top 10 (up from number 51 last week) and would quickly plant itself at number 1 for eight weeks - longer than any chart-topper all year. The sickly sweet ballad was taken from the film The Woman In Red, for which Stevie recorded the soundtrack album (with a little help from Dionne Warwick). While the Gene Wilder/Kelly Le Brock rom-com wasn't one of the year's more successful movies, "I Just Called..." was massive, even if some of Stevie's fans felt its ultra-commercial sound strayed too far from his earlier more soul and funk-based efforts. As well as topping the chart in Australia, the US, the UK and pretty much everywhere else in the world, the song won the Academy Award for Best Original Song, beating four other US number 1 hits - the only time all five nominees have been chart-toppers. There was some question about the eligibility of "I Just Called..." for the Oscar when it came out Stevie had written the music for the song in 1976. That fact was revealed during legal proceedings for plagiarism, with a pair of songwriters alleging Stevie had borrowed from a song they played him later that year. In the end, Stevie won the case and, given the lyrics to "I Just Called..." had been added to the tune for its inclusion on the soundtrack, that was clearly sufficient for the song to be considered as having been written specifically for the movie. Next week: the biggest hit by an Australian synthpop band and the final hit by a New Zealand new wave band. What you've said about "I Just Called" basically proves that it should NOT have been eligible for thee Academy Award. I checked out an article about the lawsuit and Stevie states that he came up with the idea for the song and had enough of an idea to create a verse and a chorus at the time, but took it no further than that. Even though the 1976 version is vastly different to the 1984 version (apparently - at least the title remains), the fact that it was not created specifically for the movie deems it ineligible. I suspect the Academy might have thought it was too much trouble to debate its eligibility five years down the track, so they let it slide. Songs whose music was written for one movie (but not used) and then it was developed into a song for use in another have been deemed ineligible in the past. "Jai Ho" should have been deemed ineligible for this reason, but it wasn't, so the Academy is inconsistent in its application of the rules. However, they still saw fit to disqualify Madonna's "Masterpiece" because it began around 5 seconds after the rules stated it was supposed to over the closing credits, even though it had won the Golden Globe in the same category (go figure!). The song by The Promise song is surprisingly decent. I had completely forgotten about 'Cover Me' until about 5 years ago when I saw it on a printed chart and looked it up on YouTube out of curiosity. It's one of my favourite songs of his, no doubt benefiting from the lack of continued saturation, despite being on high rotation on radio at time time. The dialogue intro to 'We're Not Gonna Take It' is a classic; the song less so, though it's still quite memorable. The musical backing of 'I Just Called...' sounds like it could have been played on a keyboard you could buy K-Mart by the sounds of it, in retrospect.